Lu Bird Baby: Time for Tea Giveaway! with my new "Time for tea" felt set. Chocolate, vanilla and strawberry goodness. This week I'm giving away one of my new "Time for Tea" felt sets! 1. Leave a comment telling us your favorite kind of tea. 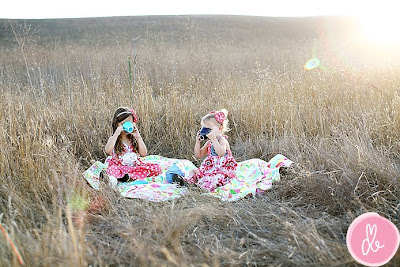 *Pictures of the girls having a tea party are Julie from Joy's Hope adorable daughters taken by the amazingly talented Drew B. Go check out their amazing blogs. Now. You will be hooked. I promise. My favorite tea is Luzianne. We drink a gallon or more of sweet iced tea a day. Every birthday we get out my mom's tea set and have a birthday breakfast with hot tea. They add more sugar and milk than tea. So we have sugar with a touch of tea. I love orange tea, or chai if that counts! Back in my working days, I would sip some every afternoon at my desk! I love sweet iced tea! For hot tea, I love green tea. And I follow your tweets. Thanks again for the chance to win. I don't know that it's a kind but I'm from the south so it's got to be sweet tea- the kind that resembles syrup. Lol. my favorite tea is chi tea from starbucks...but another favorite is a tea called red label. I don't drink tea so I don't have a favorite. My daughters would LOVE this set. I could see them playing with it for hours. Such an awesome giveaway! My favorite tea is mint tea! Have a wonderful weekend! I am a follower and I love Earl gray tea~ With LOTS of sugar and milk~ YUM-O! Well, since I just became a follower I might as well enter this contest...My girls are way into tea parties, so I've got my fingers crossed. 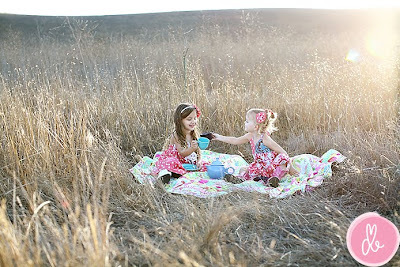 And our favorite tea around here is Chamomile - no caffeine so we can actually use it for the little girls' tea parties! Favorite kind of tea I'm afraid is the way too sweet kind. I've tried and tried with the hot tea variety, but still I want it cold with a slice of lemon. However, I have two little girls who love themselves some pretend tea parties! although I'm Canadian, my great grandmother was very British and we were allowed to drink tea at an early age. We always had Earl Grey, black. I guess it stuck with me because it seems to be my fav today. Your post reminded me it's about time I sit down with my daughter and have a spot. My favorite tes is sugar plum spice by celestial seasonings--- yummy! Even though it's not THAT kind of tea, we love Red Diamond Sweet Tea here. I follow your blog. If i win I'm giving this to the little girl I nanny for christmas. It is so adorable! My favorite tea is sweet tea from Mccalisters. BEST SWEET TEA EVERR! I'm kind of traditional, I love Earl Grey Tea and I'd love your felt tea set! Green tea! Love your blog.